Megathreads getting cleaned up, so here is round 2. What are you listening to? Lately I've just been listening to old Alkaline Trio albums, we are going to see them play some of their old stuff in a couple months and it's making me nostalgic for their old music. Since I'm in a Gibb groove lately (hmmm, may be an omen. Barry must be on death's door or something.) I skimmed YouTube and found this cute clip (terrible video quality though) from the brothers on The Midnight Special. Great live, even when they were being silly. 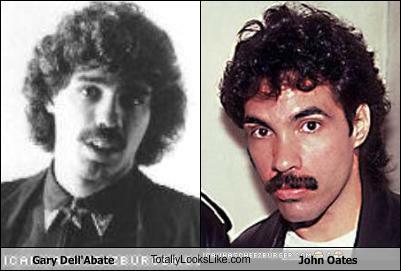 Oates looks like Gary Delabate'. Why, whatever do you mean??? omg, he's an absolute dead ringer. palta, sputnik and Lalasnake like this. Roger Voudouris, his funky red v-neck jumper, tight jeans and Wind Machine.. Putting off starting my day by listening to Leonard Cohen. I haven't listened to him in a long while, forgot how much I love him. Especially So Long, Marianne! I'm listening to the person above me, deep breathing. I swear I heard the lick the mic, and say baaaa. O....K... not understanding the quote above. lol. Listening to Michael Jackson, Bad. Lmao, just a random drunk reply. That said. I get a ladyboner over string quartets or cellists, especially whan it comes to covers of modern songs. Sure, the oldies (ca 1795) are good, but the "modern" covers are amazing to me. Clubber Lang, Lalasnake and ConstanceSpry like this. I also am a diehard fan of the Vitamin String Quartet. This non-video, as in there is nothing to see, is the song that got me hooked on them. I own every album of theirs. BelledeJour and ConstanceSpry like this. I love the Vitamin String Quartet's version of Pumped Up Kicks, I bought it actually. At the minute I'm listening to the Guardians of the Galaxy soundtrack, because it's awesome. Heard it in a movie and I like it.